Please select the desired product, then click the "Add to Cart" button. To add another product: At the next ("Shopping Cart") screen, click the "Continue Shopping" button. To change the quantity ordered: At the "Shopping Cart" screen, enter the desired quantity to the left of the product(s), then click the "Update" button. Special Pro Guide discounts available. Please email or call Kokabow Fishing Tackle for details. 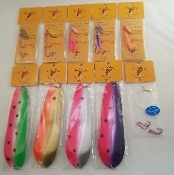 Based on angler's success this complete package will bring fun and excitement to your day. Will 2018 be the year of the record size Kokanee from Lake Roosevelt, Washington? Kokabow's "state record" Kokanee kit will surely help provide that record. Leader lengths from 10" - 16"
Six highly effective scents proven to drive kokanee and trout Krazy! N.W. Rod Bender Adventures Shoepeg Scented Corn is recognized throughout the Northwest for its quality and proven results. 2 ounce wide mouth jar. 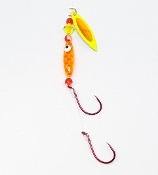 The Bandit Spinner is made with orange & chartreuse glass beads, one large orange crystal and a small orange crystal in between the two Gamakatsu hooks, an orange willowleaf blade topped with chartreuse prism tape. 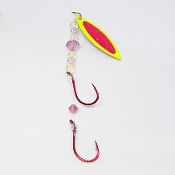 The Big Sky Suprise Spinner is made with pink & red glass beads, one large pink crystal and a small pink crystal in between the two Gamakatsu hooks, a brass willowleaf blade topped with pink prism tape. The Black Eagle Spinner is made with black & white glass beads, one large clear crystal and a small clear crystal in between the two Gamakatsu hooks, a black willowleaf blade topped with silver prism tape. 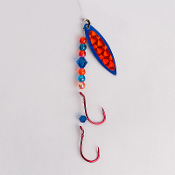 The Blue Fury Spinner is made with blue & orange glass beads, one large blue crystal and a small blue crystal in between the two Gamakatsu hooks, a blue willowleaf blade topped with orange prism tape. 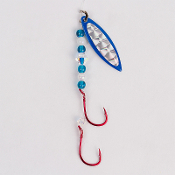 The Blue Heron Spinner is made with blue & white glass beads, one large clear crystal and a small clear crystal in between the two Gamakatsu hooks, a blue willowleaf blade topped with silver prism tape. 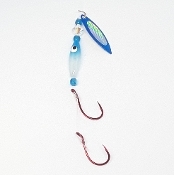 The Blue Heron is great for evening or cloudy day fishing. 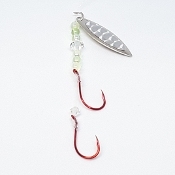 The Eagle Spinner is made with red & white glass beads, one large crystal and a small red crystal in between the two Gamakatsu hooks, a red willowleaf blade topped with silver prism tape. 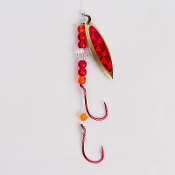 The Falcon Spinner is made with red & orange glass beads, one large clear crystal and a small orange crystal in between the two Gamakatsu hooks, a brass willowleaf blade topped with red prism tape. 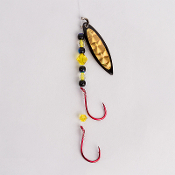 The Harpy Spinner is made with yellow and black glass beads, one large yellow crystal and a small yellow crystal in between the two Gamakatsu hooks, a black willowleaf blade topped with gold prism tape. 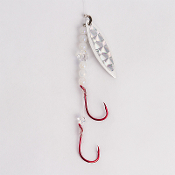 The Harrier Spinner is made with all white glass beads, one large clear crystal and a small clear crystal in between the two Gamakatsu hooks, a white willowleaf blade topped with silver prism tape. The Hawk Spinner is made with red, white & orange glass beads, one large orange crystal and a small orange crystal in between the two Gamakatsu hooks, a brass willowleaf blade topped with gold prism tape. 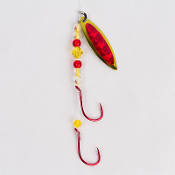 The Kestrel Spinner is made with yellow and red glass beads, one large Yellow crystal and a small yellow crystal in between two Gamakatsu hooks, a metallic yellow willowleaf blade topped with red prism tape. 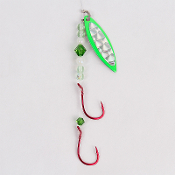 The Kingfisher Spinner is made with green & white glass beads, one large green crystal and a small green crystal in between the two Gamakatsu hooks, a green willowleaf blade topped with silver prism tape. 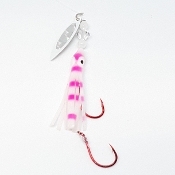 The Lucky Strike Spinner is made with white and pink glass beads, one large pink crystal and a small pink crystal in between the two Gamakatsu hooks, a white willowleaf blade topped with pink prism tape. The Mango Tango Spinner is made with pink & chartreuse glass beads, one large pink crystal and a small pink crystal in between the two Gamakatsu hooks, a chartreuse willowleaf blade topped with pink prism tape. 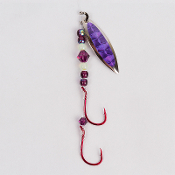 The Merlin Spinner is made with purple and white glass beads, one large purple crystal and a small purple crystal in between two Gamakatsu hooks, a nickel willowleaf blade topped with purple prism tape. 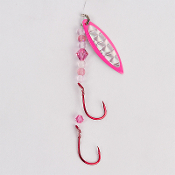 The Osprey Spinner is made with two different shades of pink glass beads, one large pink crystal and a small pink crystal in between the two Gamakatsu hooks, a pink willowleaf blade topped with silver prism tape. 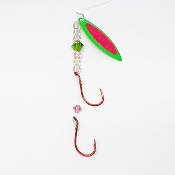 The Peregrin Spinner is made with pink & green glass beads, one large green crystal and a small pink crystal in between the two Gamakatsu hooks, a green willowleaf blade topped with pink prism tape. The Pink Panther Spinner is made with pink and black glass beads, one large pink crystal and a small pink crystal in between the two Gamakatsu hooks, a black willowleaf blade topped with pink prism tape. 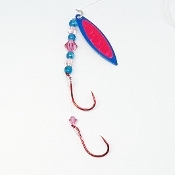 The Predator Spinner is made with blue & pink glass beads, one large pink crystal and a small pink crystal in between the two Gamakatsu hooks, a blue willowleaf blade topped with pink prism tape. 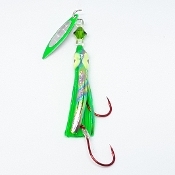 The Raptor Spinner is made with light green & blue glass beads, one large green crystal and a small clear crystal in between the two Gamakatsu hooks, a nickel willowleaf blade topped with chartreuse prism tape. 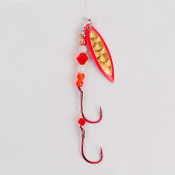 The Ravisher Spinner is made with orange & pink glass beads, one large orange crystal and a small orange crystal in between the two Gamakatsu hooks, an orange willowleaf blade topped with pink prism tape. 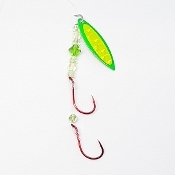 The Screamin' Green Spinner is made with green & chartreuse glass beads, one large green crystal and a small green crystal in between the two Gamakatsu hooks, a green willowleaf blade topped with chartreuse prism tape. 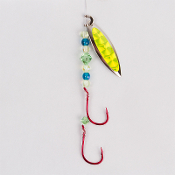 The Silver Bullet Spinner is made with green and yellow transparent glass beads, one large clear crystal and a small clear crystal in between the two Gamakatsu hooks, a silver willowleaf blade topped with silver prism tape. 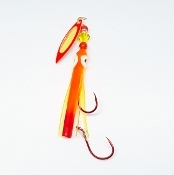 The Talon Spinner is made with orange & white glass beads, one large orange crystal and a small orange crystal in between the two Gamakatsu hooks, an orange willowleaf blade topped with gold prism tape. The Black Eagle Squid is made with a 1.5" luminescent skirt, black glass beads, one large clear crystal, a black mini willowleaf blade topped with silver prism tape. 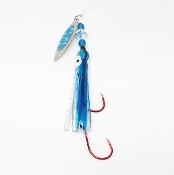 The Blue Heron Squid is made with a 1.5" glitter skirt, blue glass beads, one large clear crystal, a silver mini willowleaf blade topped with blue prism tape. 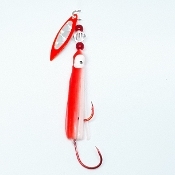 The Eagle Squid is made with a 1.5" UV skirt, red glass beads, one large clear crystal, a red mini willowleaf blade topped with silver prism tape. 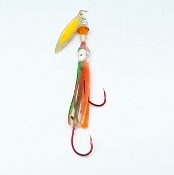 The Fool's Gold Squid is made with a 1.5" luminescent skirt, green glass beads, one large orange crystal, a brass mini willowleaf blade topped with orange lazer prism tape. 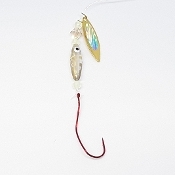 The Harrier Squid is made with a 1.5" skirt, white glass beads, one large clear crystal, a white mini willowleaf blade topped with silver prism tape. The Kingfisher Squid is made with a 1.5" luminescent skirt, green glass beads, one large green crystal, a green mini willowleaf blade topped with silver prism tape. 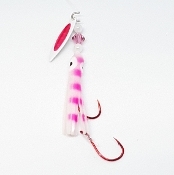 The Lucky Strike Squid is made with a 1.5" skirt, white glass beads, one large pink crystal, a white mini willowleaf blade topped with pink prism tape. 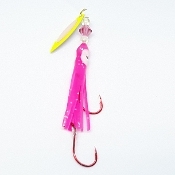 The Mango Tango Squid is made with a 1.5" luminescent skirt, chartreuse glass beads, one large pink crystal, a chartreuse mini willowleaf blade topped with pink lazer prism tape. The Merlin Squid is made with a 1.5" UV skirt, pink glass beads, one large purple crystal, a silver mini willowleaf blade topped with purple prism tape. 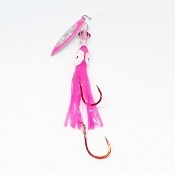 The Osprey Squid is made with a 1.5" UV skirt, pink glass beads, one large pink crystal, a pink mini willowleaf blade topped with silver prism tape. 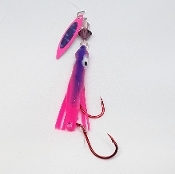 The Predator Squid is made with a 1.5" luminescent skirt, blue glass beads, one large pink crystal, a blue mini willowleaf blade topped with pink lazer prism tape. The Raptor Squid is made with a 1.5" luminescent skirt, blue glass beads, one large green crystal, a silver mini willowleaf blade topped with chartreuse prism tape. 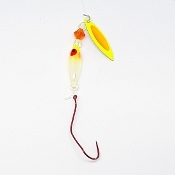 The Sun Devil Squid is made with an orange, chartreuse and red tipped 1.5" UV skirt, orange glass beads, one large yellow crystal, a red mini willowleaf blade topped with chartreuse prism tape. The Sunset Squid is made with a 1.5" luminescent skirt, pink glass beads, one large purple crystal, a pink mini willowleaf blade topped with purple prism tape. 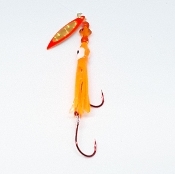 The Talon Squid is made with a 1.5" UV skirt, orange glass beads, one large orange crystal, a orange mini willowleaf blade topped with gold prism tape. 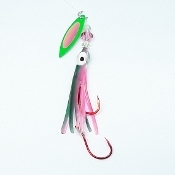 The Wild Watermelon Squid is made with a 1.5" luminescent skirt, green glass beads, one large pink crystal, a green mini willowleaf blade topped with pink lazer prism tape. 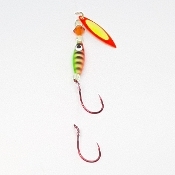 The Bandit Bug is made with green glass beads and a large orange crystal, two Gamakatsu hooks, an orange willowleaf blade topped with chartreuse lazer tape. 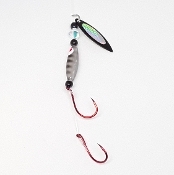 The Black Eagle Bug is made with black glass beads and a large clear crystal, two Gamakatsu hooks, a black willowleaf blade topped with silver lazer tape. 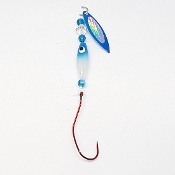 The Blue Heron Bug is made with blue glass beads and a large clear crystal, two Gamakatsu hooks, a blue willowleaf blade topped with silver lazer tape. 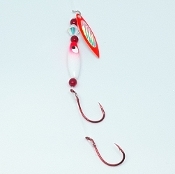 The Eagle Bug is made with red glass beads and a large clear crystal, two Gamakatsu hooks, a red willowleaf blade topped with silver lazer tape. 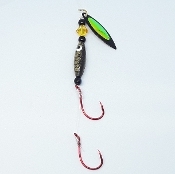 The Harpy Bug is made with black glass beads and a large gold crystal, two Gamakatsu hooks, a black willowleaf blade topped with lazer tape. 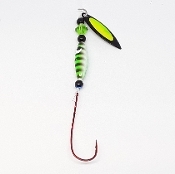 The Hawk Bug is made with chartreuse glass beads and a large gold crystal, two Gamakatsu hooks, a brass willowleaf blade topped with silver lazer tape. 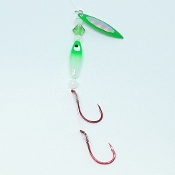 The Kingfisher Bug is made with white glass beads and a large green crystal, two Gamakatsu hooks, a green willowleaf blade topped with silver lazer tape. 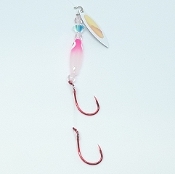 The Lucky Strike Bug is made with pink glass beads and a large clear crystal, two Gamakatsu hooks, a white willowleaf blade topped with pink lazer tape. 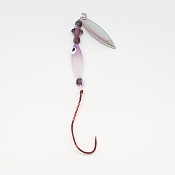 The Merlin Bug is made with purple glass beads and a large purple crystal, two Gamakatsu hooks, a silver willowleaf blade topped with purple lazer tape. 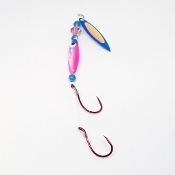 The Osprey Bug is made with white glass beads and a large pink crystal, two Gamakatsu hooks, a pink willowleaf blade topped with pink lazer tape. The Peregrine Bug is made with pink glass beads and a large green crystal, two Gamakatsu hooks, a pink willowleaf blade topped with green lazer tape. 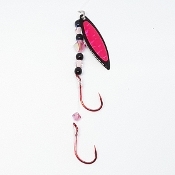 The Pink Panther Bug is made with black glass beads and a large pink crystal, two Gamakatsu hooks, a black willowleaf blade topped with pink lazer tape. 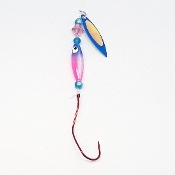 The Predator Bug is made with blue glass beads and a large pink crystal, two Gamakatsu hooks, a blue willowleaf blade topped with pink lazer tape. 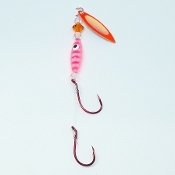 The Ravisher Bug is made with pink glass beads and a large orange crystal, two Gamakatsu hooks, an orange willowleaf blade topped with pink lazer tape. 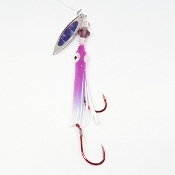 The Sangira Bug is made with purple glass beads and a large pink crystal, two Gamakatsu hooks, a silver willowleaf blade topped with purple prism tape. 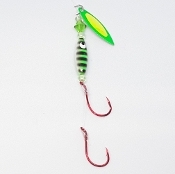 The Screamin' Green Bug is made with green glass beads and a large green crystal, two Gamakatsu hooks, a green willowleaf blade topped with chartreuse lazer tape. 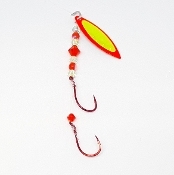 The Sun Devil Bug is made with chartreuse glass beads and a large orange crystal, two Gamakatsu hooks, a chartreuse willowleaf blade topped with orange lazer tape. 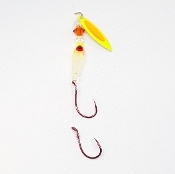 The Sunburst Bug is made with orange glass beads and a large yellow crystal, two Gamakatsu hooks, a chartreuse willowleaf blade topped with orange lazer tape. 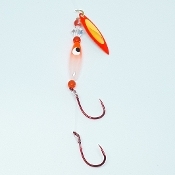 The Talon Bug is made with orange glass beads and a large clear crystal, two Gamakatsu hooks, an orange willowleaf blade topped with orange lazer tape. 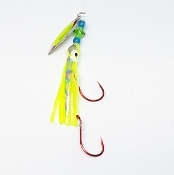 Custom tied Walleye and Perch spinners using Slow Death hooks, glass beads and premiere quality crystals. 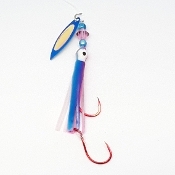 This speciality blade adds extra action to your lure due to its unique design. Each blade is inlaid with glitter for reflection of light and attraction of fish. 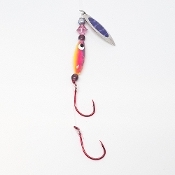 This speciality blade adds extra action to your lure due to its unique design. This blade is highly reflective in the water with its gold foil shine and urethane protective coating. 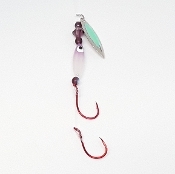 This speciality blade adds extra action to your lure due to its unique design. The Lincoln Tail Feather Blade has a copper finishing on both sides. 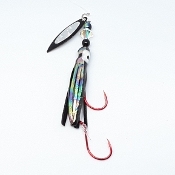 Excellent attractor with a Kokabow Spinner. This speciality blade adds extra action to your lure due to its unique design. This blade is highly reflective in the water with its silver foil shine and urethane protective coating. The Harrier In-Flight Troll is 26 inches long, built with a silver rudder, coated wire and five pearl white willowleaf blades with silver prism tape. 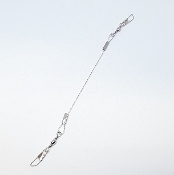 Each blade is accompanied by a clear crystal and two white glass beads. The In-Flight trolls.. The Kestrel In-Flight Troll is 26 inches long, built with a gold rudder, coated wire and five metallic yellow willowleaf blades with red prism tape. Each blade is accompanied by a yellow crystal and two red glass beads. The In-Flight trolls.. The Merlin In-Flight Troll is 26 inches long, built with a silver rudder, coated wire and five silver willowleaf blades/ purple prism tape. Each blade is accompanied by a purple crystal and two white glass beads. 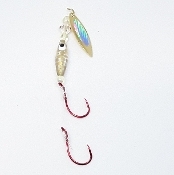 The In-Flight trolls are..
Inline lead trolling sinkers with molded crane swivels. Great for long line trolling and helping reduce line twist. Excellent accessory for the trolling enthusiast! 7" or 14" wire with swivel ends to connect dodgers or blades. 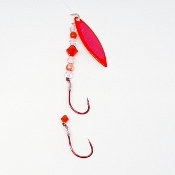 Pre-tied snells with two razor sharp #4 Red Octopus Gamakatsu Hooks, Maxima 12 lb test line & 24 inches of leader. Downrigger release clip made with Offshore light adjustable clip, Scotty self-locating snap, 60 lb wire and safety clip. 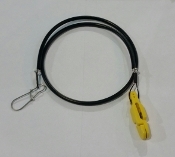 Downrigger release clip made with Offshore light adjustable clip, 60 lb wire and clip. 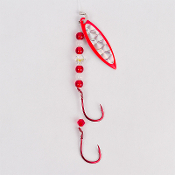 Attaches directly to downrigger weight. Pacific Headwear embroidered Kokabow hat - P-TEC Performance Mesh Material is the latest in material development from Pacific Headwear. Featuring breathable moisture-wicking mesh material that allows you to look and perform at your best. 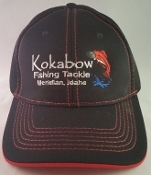 Copyright © 2013-2019 Kokabow Fishing Tackle, LLC. All rights reserved.